Visitors to the Prototek Manufacturing have a unique opportunity to preview Prototeks latest combination laser / turret punch press, the model LC2012C1-NT, also known simply as the “C1”. According to Amada America, the C1 has been engineered from the ground-up based upon extensive feedback received from a wide range of worldwide customers, like Prototek Manufacturing. The goal of the C1 is to provide Prototek the ability to work with materials up to 1/4” thick with seamless process integration of laser and punching operations, to increase productivity while reducing costs. In addition, the C1 reflects Prototek’s ongoing commitment to purchase machines that are friendly to the environment through reduced energy and petroleum product consumption. 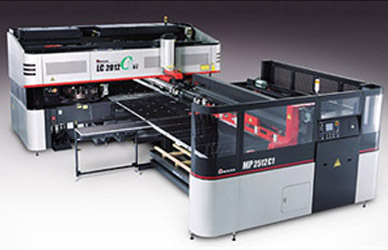 The laser portion of the C1 features the Amada/Fanuc AF2000i-B LU2.5 resonator with 2.5 kilowatts of cutting power. The laser head moves in the Y-axis via a direct drive servo mechanism for maximum speed and accuracy, and is isolated from punching vibration to help maintain beam integrity and cut quality. A cartridge-type lens assures simple and fast lens changes when required. The resonator is located on a frame designed to reduce floor space requirements and to provide isolation from punching vibration. The punching portion of the C1 is based upon the highly successful AC-series of 22-ton servo drive turret punch presses. The servo drive not only offers punching speeds of up to 370 hpm on 1” centers, but is also more efficient than hydraulic punch drives, requiring no pump or chiller. To maximize punching productivity in conjunction with laser cutting, the C1 features the new 45-station MPT Multi-Purpose Turret. Two of the unique features of the MPT turret include four tapping tool stations (English and metric thread tools available) and three powered die lift stations to facilitate upward forms while reducing material scratches and preventing downward forms from hitting the forming dies during sheet movements. The C1 is equipped with a versatile brush table that provides a number of features to increase productivity and part quality. The brushes help reduce material scratching, while limiting punching noise. Pop-up urethane rollers help reduce brush wear during the laser processing of thick materials. Special high-temperature brush material is installed in the laser cutting area (Y-axis), and a large 15-3/4” x 50” work chute helps ensure the easy removal of finished parts and scrap. A lifting brush table section helps to remove downward forms from the die before the next sheet moves into place. An automatic sheet loading feature simply requires the operator (in manually loaded applications) to place the sheet within approximately 2” of the X-Y gauge blocks, and activate the automatic loading mechanism. This provides accurate material placement against the gauge blocks and activates the pneumatic work clamps. With its full 4’ x 8’ sheet capacity in up to 1/4” thick material, the C1 achieves better material utilization ratios, especially when using our Blank software for dynamic nesting. Designed with a small footprint to reduce the amount of floor space required at our plant. According to Bruce, Keith and Darlene Isabelle and Brian Francoeur, Prototeks Production Managers: We see the C1 machine as an excellent choice for Prototek, we recognize how important it is to provide fast, flexible responses to our customer demands. The innovative features of the C1 not only provide a fast track from print-to-part, but will help eliminate many costly secondary operations, which frees-up shop labor for more value-added tasks. We feel that we will experience not only increased productivity but reduced costs, but we will also gain the capabilities to offer new services or take on work that they may never have been able to profitably do before. Prototek Manufacture continues to invest in the latest technologies for speed and efficiency. It is an ongoing commitment to find the new technologies that will help Prototek reduce green house gasses to the environment by purchasing these new green machines.